Replace MSP with PDP: why? Why do we need MSP? Individually, most Indian farmers produce very little marketable surplus due to small landholdings, and don’t own cold storage infrastructure, hence they can’t command the commodity prices unlike the Saudi princes’ oil wells and OPEC cartel. Traders occupying cold storage space for hoarding potatoes and onions. Commodity market players protect themselves from price fluctuations by purchasing call options and put options. But, small farmers can’t do it. MSP procurement excessively focus on the wheat, rice and sugarcane. This has led to depletion of water resources, soil degradation and deterioration in water quality in some states, especially in the north-western India. MSP procurement of rice & wheat distorts cropping patterns, because farmers avoid pulses, oilseed and coarse grains. This result is inflation, especially in pulses and edible oil. They don’t reflect the social and environmental costs. e.g rice and sugarcane consume high amount of water, versus Pulse cultivation consumes less water, helps in nitrogen fixing and pulses are the primary source of protein for vegetarian population of India. But the Commission for Agricultural Costs and Prices (CACP) recommends the MSPs to government only based on the economic terms such as production cost, international prices, supply vs demand vs inflation. So, present MSP system is not aligned with SDG goals. Many farmers lack awareness about MSP or they are far away from FCI procurement areas. MSP further aggravates the backwardness of eastern states, where procurement at the MSP is minimal or non-existent. To solve above problems in MSP, Both NITI and Economic Survey recommend Price Deficiency Payment (PDP). Declare MSP for all types of crops. 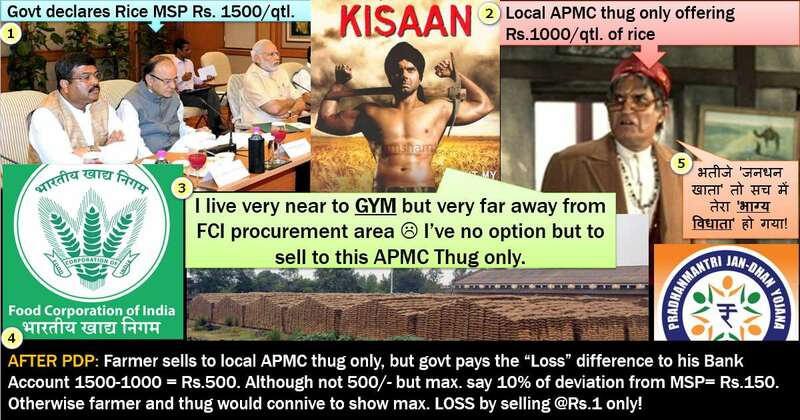 Each farmer would register his crop and acreage sown with the nearest APMC mandi. If the market price then falls below the floor price, the farmer would be given DBT of the difference up to a maximum of, say, 10% of the MSP-linked price, into his Aadhaar-linked bank account. WTO’s Subsidy restriction norms complied. All crops and all farmers can benefit in all regions. Farmer’s response to price uncertainty comes only after the lag of year. E.g. in Year#1, if tomatoes are selling at over Rs.100 per kilo due to shortage, then next year all farmers will shift from onions to tomatoes cultivation to fetch better returns, leading to excess production and drastic fall in the tomato prices may be Rs.5 per kilo; while simultaneously onion reaches at Rs.100/kg. In the post independent India, despite the abolition of zamindari, the farmers were not ‘liberated’ from exploitation. Because the goons of local bainyaa or moneylender would (often forcibly) take away the produce to recover their dues without adequate compensation to the farmer. To address this nuisance, state governments began enacting laws to provide that “first sale of agriculture produce can occur only at the government notified market yards only”. Such laws are known as “APMC Acts”. APMC office bearers are politically influential persons. They enjoy a cozy relationship with the licensed commission agents. These agents then form cartel, manipulate prices and deprive farmers of remunerative prices. While these Mandis charge multiple entry, exit and other fees. But money is siphoned off hence they’ve poor infrastructure, lack of cold-storage and transport facilities esp. for fruits and vegetables. This leads to substantial waste of the produce despite bumper harvests during good monsoon years. Thus, APMC’s cartelization and poor infrastructure leads to artificial or real shortage of food supply in the retail market, thereby driving up the food inflation. Replace the APMC ‘licensed’ intermediary system with open registration backed by bank guarantees. So that entrepreneurs without political clout, can also enter this game. Buy produce directly from the farmer. This will create competition and pave the way for the farmer to receive lucrative prices. For small farmers it is neither feasible nor profitable to take their produce to markets, so governments should allow for “aggregators” who would collect produce from farmers for sale in competitive marketplaces. Exempt perishables from the APMC acts. Promote farmer cooperatives for direct retailing to customers. Any registered buyer located anywhere in India can buy from any farmer anywhere in in India. In theory, E-NAM is to reduce the asymmetry of information between buyer and seller; as well as the cartelization among buyers. But…. Buyers (especially food processing companies) have a strong preference for physical inspection of grain (instead of online purchase), but sellers (Farmers) fear this will reduce the prices, as buyers will make frivolous complaints about poor-quality. Ultimately, both big buyers (such as food processing companies, big retailers etc.) and small farmers feel hesitant in opting for E-NAM online trading. Suggested Reforms in E-NAM? Third party assaying and quality certification mechanisms, dispute settlement mechanisms, systems for forwarding goods to buyers etc….only then both buyer and seller can trade confidently. Indian agriculture has predominance of small and marginal farmers, for whom Mechanization and economies of scale not possible. They have very little marketable surplus, their bargaining power is low. They’re price takers, not price makers. Consequently, the annual median agriculture income for an Indian farmer is less than 20,000 rupees. Therefore ______ reform(s) is essential for enhancing their income and achieving the target of doubling the farmers income by 2022. SDG (Goal#2) requires all the nations to double small farmers’ incomes by 2030 and correct the restrictions and distortions in the local and international agricultural markets. Indeed, the ____ reform in MSP/APMC/E-NAM therefore deserves priority and attention. The directive principles of state policy enshrined in our constitution requires the governments to ensure the right to adequate means of livelihood for all citizens and prevent of concentration of wealth. The APMC cartels (or the aforementioned issues in MSP) are one of the stumbling blocks in this path, hence aforementioned reforms need to be implemented on on war-footing. Store food buffer to ensure food security and price stability. FCI also keeps 5 million tones of food grains as “Strategic reserves” for extreme situations. Sell/ Distribute the food grains to consumers, especially poors, at affordable prices [=Central Issue Price (CIP)]. It’s not open ended. Here, “state wise, beneficiary wise” allocation depends on various rules and laws. Increases food grains supply @lean season, thereby moderating the inflation. Excess stocks offloaded so, FCI’s godown/storage cost is reduced. Saves food grains from deteriorating in public godowns. Objective is similar to OMSS i.e. curb food inflation. Union Government gives interest free advances to various central/state/UT agencies to procure food from local and foreign farmers and sell it to aam-aadmi at reasonable prices. Food corporation of India (FCI) is responsible for procurement, storage and distribution of food grains. Wherein State Government themselves procure and distribute the wheat and rice. Union will bear the costs. Procurement of foodgrains more suited to local taste for distribution under the targeted public distribution system (TPDS) [लक्षित सार्वजनिक वितरण प्रणाली]. Associated topic is Shanta Kumar Committee on FCI reforms. I’ve given its summary in this Article (Click Me). 1997: Department of Food & Public Distribution started Targeted Public Distribution System (TPDS) to provide affordable food grains to poor Indians. NFSA has lifecycle approach i.e. For pregnant and lactating mothers: cash transfer + food grain. For others: food grains at subsidized prices: coarse grains @Rs. 1/kg, Wheat @ Rs. 2/kg,Rice @Rs.3/kg with quota limits, viz. For antyodaya Anna households i.e. poorest of the poor: 35 kg per family per month. 2016: All States/UTs have implemented this NFSA act. I’m not going into Malnutrition, merits/demerits of DBT/UBI etc. here, we’ll see it along with Human development i.e. 6th pillar. As such the three part series “input-R&D-output” is over, but some misc. allied topics are still pending such as Tomato inflation and animal husbandry. That we’ll see in the next time. I hope you are doing well!!!!! Kindly Request you to upload answer in Hindi also. hopefully these articles including previous one with rajtanil mam’s agriculture slides will suffice for mains 2017 preparation. thanx mrunal..
For phase 2 , in paper 1 sociology paper… a book by C N Shanker Rao – sociology is given in the reference material. But there are two books by C N Shanker Rao..”Sociology on indian society” and ” Sociology – principles of sociology with an introduction to social thoughts”. Sir can you please make a lesson on N.K.Singh reccos? Why is targeting Debt to GDP better than FD? What is CEA’s dissent? Should we prepare all this in detail? Can you please give the source of the data of farmer’s income of Rs 20K per year? I saw some reports saying it’s Rs 6426 per month as per Situation Assessment Survey of Agricultural Households in its NSS 70th round. Your lecture series is too useful for maharashtra psc thank you mrunal sir. Thankyou sir. Offering my humble gratitude. You’re a Godsend!! And I’m so glad humour-laced, succinct but comprehensive English articles are back. Thank you!